Preheat the oven to 200°C/400°F/ Gas Mark 6. Line a baking sheet with baking parchment. Rub the butter into the flour using your fingertips until it resembles fine breadcrumbs. Stir in the Wensleydale & Cranberry cheese and cinnamon powder. Gradually add the milk stirring with a knife until the mixture begins to stick. With your hand, knead the mixture until a smooth dough is formed. Flatten or roll the dough about 3cm thick. Use a 6cm round cutter to cut out individual scones. Place the scones on the baking parchment. 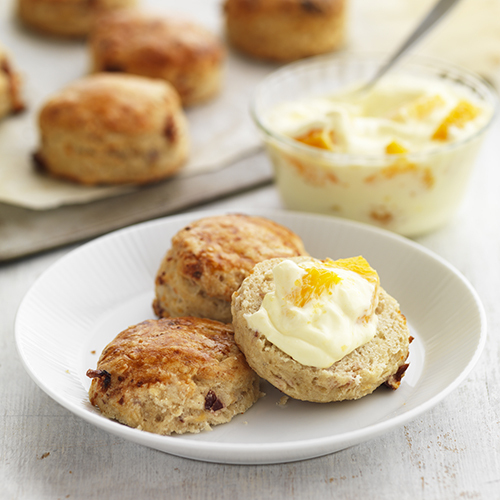 Add 1tbsp cold water to the egg yolk and brush the tops of the scones. Meanwhile, mix the cream, orange pieces, juice, liqueur (if using) and icing sugar together.